It's 2019 and we all know Los Angeles is one of the most exciting cities to eat in. It's also one of the most exciting places to drink. From bitters to bar programs, ladies are making the local booze scene better. Relax, dudes are doing cool things too. But since this is Women's History Month, we're highlighting a few of the most intriguing L.A. women to pull a pint of beer, pour a carafe of wine or jostle a cocktail shaker. While we hate leaving out any of our city's bartenders, brewers, business owners, vintners, sommeliers, restaurateurs or proprietors, know that this is just a taste, an aperatif, if you will, of our city's talent. Genever, a bar that opened in March 2018 in Historic Filipinotown, was conceived six years ago by college friends Patricia Perez, Roselma Samala and Christine Sumiller. The three UCLA alumnae wanted to celebrate their backgrounds while launching a business. "We were so lucky to find our space in HiFi because it met the requirements of our business and met the requirements of our heart, of our spirit," Samala says. About that spirit, it's gin. Filipinos reportedly consume the most gin in the world, by volume. All three grew up around Ginebra San Miguel, a Dutch-style gin, that's popular in the Philippines. But that wasn't the only reason they chose the spirit. "Our first cocktail was a gin and tonic," Sumiller says. "It's so simple but we completely fell in love with it, and then we found out that it's such a great spirit that you can mix with a lot of things. It goes so well in a cocktail." In its first year, Genever has become an important part of the HiFi community. Funds from the bar help support Search to Involve Filipino Americans, a non-profit organization that works to improve the quality of life for neighborhood residents. Perez and Sumiller are both involved with Kayamanan Ng Lahi Philippine Folk Arts, a non-profit dedicated to preserving Philippine arts, culture and music. Genever's opening was made possible, in part, by a crowdfunding campaign and you'll find the names of those who donated engraved on tables and bar stools and integrated into the gilded artwork on the back wall. L.A.-based Yael Vengroff is a force of nature. As the beverage director at The Spare Room, the Hollywood Roosevelt Hotel's discreet, bowling alley and board games bar, she has created menus of inventive craft drinks. During the warmer months, she hosts a monthly tiki night with a rotation of renowned guest bartenders. She also upgraded the cocktail program at long-standing New York-style Chinese restaurant and music venue Genghis Cohen, on Fairfax Ave. Concoctions like the lychee martini, made with coconut oil-infused vodka, lychee and aloe vera are so good, they might make you forget the horrors of early fusion cuisine. Vengroff, 31, has worked in hospitality since she was 18. She was the second woman behind the bar at Audrey Saunders' legendary Pegu Club in New York. Other bars under her belt include Harvard & Stone in East Hollywood and Painkiller/PKNY and Maison Premiere, in New York. Her work has paid off in awards and recognition from fellow bartenders and imbibers. She was the first champion of Speed Rack, a round-robin competition dedicated to raising money for breast cancer research. In 2018, she became only the second woman to be named American Bartender of the Year at the Spirited Awards. The Spare Room was also named Time Out's Los Angeles Bar of the Year in 2016. Vengroff credits her work ethic for her success. "I will always say that my biggest nemesis is myself," she says. "I'm responsible for everything I cannot do and everything I cannot overcome." Rachel Thomas had plenty of experience opening bars in DTLA. She had overseen The Must and Perch (both with Coly Den Haan) but this time around, she wanted to create a neighborhood bar that served interesting drinks. The result is rose-tinged Bar Franca in the Historic Core. Although she has business partners, she's the sole owner. She figured that would eliminate most of the sexism and harassment she had faced in the hospitality industry. Not so much. "It doesn't matter if you're the boss, which is kind of shocking," Thomas says. Building out and running Bar Franca, which opened in September 2018, Thomas says she has faced harassment from male subordinates, construction workers and bartenders, who she has had to fire. She has also encountered people who refuse to believe that she owns and designed the venue. "Women have to work twice as hard. There's this assumption that women can't do this or that, that they have to be aristocrats. They're trying to find out what you didn't do," Thomas says. Thomas joined forces with bar director Laura Lindsay, who had worked at Connie & Ted's, The Fiscal Agent and Otium. Thanks to Lindsay, the seasonal drinks at Bar Franca are balanced, boozy and delicious, and enjoyed in an environment that is intentionally inclusive. "Because we are both females, we're aware of people who want to come in and not have to worry about predatory people at the bar," Lindsay says. "Even though all the other bartenders are male, they've received training where we've told them: If you see something, do something about it. They're not the type of male bartenders who are going to offer a 'girly' drink or talk down to our customers." When Ting Su, along with her husband, Jeremy Raub, and father-in-law, Steve Raub, opened Eagle Rock Brewery in 2009, it was the first production brewery within Los Angeles city limits in six decades. Breaking through L.A.'s notorious red tape, they helped ferment the city's craft beer scene — and they risked everything to do it. They started the permitting process in 2005, took out a second mortgage on their home and dipped into their savings. It paid off. In 2010, Eagle Rock Brewery won gold in the Pro-Am Competition at the Great American Beer Festival. In 2014, they opened Eagle Rock Public House, a chef-driven, craft beer-centric restaurant. As one of L.A.'s modern beer pioneers, Su feels fortunate that she's been able to help develop the local beer community. "With my being a brewery owner and a woman of color, I literally broke all the glass ceilings at once," Su says. "I didn't really lift my head up to pay attention because I was just thinking from the professional side, 'This stuff is just hard.' But I think being the owner of a brewery, there was a power shift. It would be a different game if I were a woman of color trying to apply for jobs at a brewery." When it came to beer festivals and the consumer side of the business, Su noticed a trend. "If anybody else asks me if I want a fruited wheat beer, I'm going to die" she says. "It's amazing what people think are 'chick beers.' It's still a male dominated industry." That's why, in 2011, she founded the Women's Beer Forum. Every third Wednesday, participants come together to sample new beers of varying styles from around the world. In 2018, the monthly gatherings were the target of a discrimination lawsuit filed by a litigious men's rights activist. A GoFundMe campaign raised $20,000, which covered the legal fees and the cost of the payout when Su chose to settle. It was a tough decision. Su says she did it to protect Eagle Rock Brewery and the livelihood of its employees but she is still fighting back. Su is working with a legal firm, on a pro bono basis, trying to convince politicians to close the loophole in the Unruh Act that lets men's rights groups sue for perceived discrimination. Ann Soh Woods is the founder of Kikori, a soft, completely rice-based whiskey created to mix well in cocktails. "I wanted [to make] something bright, crisp and smooth," Woods says. "I knew because I loved sake and shochu, [that] rice would be the grain that could achieve the profile I was looking for." Kikori launched in 2015 and Yuzuri, her yuzu liqueur, debuted last year. Woods believes her particular combo of inexperience and enthusiasm helped. Although she faced a steep learning curve, as a newbie she felt free to do things the way she wanted without being hampered by conventional wisdom or industry experts, most of whom are men. "In the beginning, I thought maybe I should be like them. I quickly realized that being me was just as effective," Woods says. She also credits Los Angeles for being a receptive community. "In SoCal, [you have] this very open-minded culture where the people are very familiar with different cultures. When I entered the market, women were really already part of the fabric here in L.A., as it should be, even though I sometimes still get mistaken to be the demo girl." When chefs Jon Shook and Vinny Dotolo asked Helen Johannesen if she could run a wine program, she lied. She told them "yes," figuring she could fake it til she made it. That was 10 years ago. 2019 marks Johannesen's tenth year with Shook and Dotolo's restaurant group, where she's a partner and the beverage director. That means she oversees all the libations at Animal, Son of a Gun, Petit Trois, Trois Mec, Kismet and the two Jon & Vinny's locations, which each have a wine shop. After landing in Los Angeles, she spent two years as general manager at Craft before taking some time off. She was eventually introduced to Shook and Dotolo. In her first position as a wine buyer at Animal, Johannesen pushed the limits of what diners considered desirable wines. "People had this idea that Animal is so heavy. Customers would ask me, 'Why don't you have any full, big bodied California wines on the list?' But you know what? That doesn't go with the food. You won't even be able to taste the nuance of flavor [in the food]," she says. Johannesen focused on wines that would expand diners' palates without making them "uncomfortable to be uncomfortable." "For instance, Chenin Blanc. People didn't know what it was ten years ago," she says. Now, you'll find plenty of organically farmed, small production wines among her selections, and most diners don't bat an eye. When she's not busy directing the drink program at one of the city's most prestigious restaurant groups, Johannesen hosts Wine Face. The podcast aims to demystify the world of wine by exploring varietals, regions, terminology and pairings. "The restaurant and wine scene in Los Angeles is such a cool scene," she says, "and part of the reason I started my podcast was so that we could open up even more channels for people." Despite being a London-style gin, Future Gin is all Los Angeles. It's also produced and distributed entirely by women. It's distilled at the Spirit Guild in downtown L.A. by Morgan McLachlan, distributed by locals Amy Atwood and Mary Bartlett (with the latter also involved with bar education) and marketed by Coolhaus and Ludlows Cocktail Co. founders Natasha Case and Freya Estreller. In addition to the traditional juniper, McLachlan incorporates grape leaves, Meyer lemons, grapefruit, honeysuckle and avocado leaves in the distillation process. The result is a gin with bright, citrusy notes. "The grape leaves speak to Amy's background in the wine industry and the avocado leaves come from Freya's and my back yard," Case explains. "So not only is it 100% vertically produced, owned and distributed by women, it also tastes really good." Established in 2013, the L.A. County Brewers Guild is in the business of supporting small and independent craft brewing — and business is booming. "We're seeing breweries in the most remote places now, places that didn't have a local watering hole," says Frances Lopez, the executive director of the nonprofit trade organization. According to Lopez, L.A. County had only five breweries in 2008. The following year, that became a dozen thanks to newcomers like Strand Brewing and Ladyface Ale. As of March 2019, L.A. County has 86 breweries and Lopez expects we'll hit 100 by 2020. For the past decade, Lopez has had a bird's eye view as L.A.'s craft beer scene played catch-up with San Diego, San Francisco, Portland and Colorado. "By the time we had craft brewers popping up in L.A., they started wanting to make exciting beer like Tamarind Saisons with jamaica, things that are more symptomatic of L.A. flavors. This is how we differentiate ourselves from an oversaturated market," Lopez says. Advocating for brewers, who she describes as "the moody artists of the manufacturing science world," is a natural role for Lopez. The guild spearheads initiatives — their main one is LA Beer Week — to promote local breweries. That puts her in touch with several female-owned and run breweries, like Three Weavers in Inglewood. Lopez says L.A.'s beer community isn't immune to sexism, "but overall we're a very progressive community and it's been easy for women to break out in more specific roles." She credits part of her success to the diversity here. "I probably wouldn't be in this role if I were in other areas of the U.S.," she says. "To see a woman of color in an executive position representing a male-dominated industry is still a foreign concept for a large amount of the country." It has been five years since Roni Ginach moved to Los Angeles, bringing her evangelism for natural wine from New York. Since arriving, she has built a natural wine list at Los Feliz Mediterranean restaurant Kismet, served as wine director at Cliff's Edge in Silver Lake and became the beverage director at acclaimed Santa Monica restaurant Michael's — and she has done it all while working exclusively with natural wine producers. At Michael's, she integrated some of these natural selections into the vast, old school wine list. "You kind of have to cater to every palate, and that's become easier, coming from the perspective that I do," Ginach says. "It seems like the average drinker has evolved out of the traditional Napa cab, oaky chardonnay and Sonoma coast pinot noir. They're looking for alternatives with a little bit of complexity and diversity. It's also a totally different game than it was five years ago. It was a big anomaly to have people say, 'Oh, there's this natural wine thing in L.A.' Now, it's a default in a lot of places." Her relationship with Tony Coturri, a pioneer in California natural winemaking, opened up new relationships for Ginach. Last October, she left Michael's to create her own distribution company, Roni Selects. At the moment, she's meeting winemakers and searching for more wines she can represent, hopefully for placement in shops and restaurants. "It's like the Wild West out there, a no man's land," Ginach says. "There has to be a phase of rampant experimentation before [natural wine] becomes refined. And that might last a few years. This is like the moment when avant garde becomes mainstream, in a way. I'm happy to let this ride for awhile." Coly Den Haan knew that if she wanted to open another wine shop in a city full of them, she needed something to set her concept apart. When she opened Vinovore, in a rapidly gentrifying neighborhood near Silver Lake, she made sure that at least one woman had a hand in producing every bottle that was sold at the store. "I tend to like wine made by women," Den Haan says. "They tend to be a little more elegant and a little more restrained. I'm not saving lives or doing anything major, owning a wine shop, but I thought if I could do a something that was just a little different and something I believed in, like supporting women, that's something I feel strongly about." The approach has cross-gender appeal. Den Haan says at least half of her customers are men. It helps that Vinovore is accessible and non-fussy. Bottles are sorted by a combined color-animal wheel (Gold Owl is for old world white wines and champagne; Red Lion is for earthy reds, smooth reds and smokey reds; Silver Fox is for sparkling wines, crisp white wines and mineral wines). 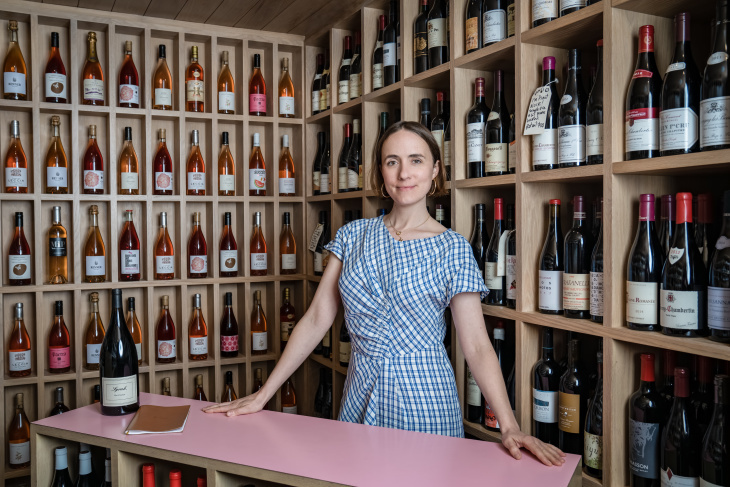 She also has a wide selection of natural wines and most bottles cost $15 to $25, so patrons can leave their comfort zone without breaking the bank.